Steward Brand, a cultural iconoclast of the highest order, continues to challenge preconceived notions of environmentalism even today, despite having been around since the earliest days of the movement. A futurist, an environmentalist, and a cultural renaissance man, Brand was a close friend of Ken Kesey and an active participant of the 1960’s counterculture movement. He founded numerous institutions such as The WELL, one of the longest-standing virtual communities in existence, and The Long Now Foundation, a not-for-profit organization that encourages long-term responsibility through various scientific and environmentalist projects. 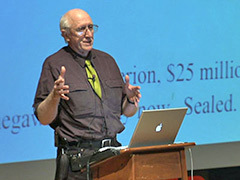 One of Brand’s earliest claims to fame came in 1966, when he made his first foray into activism by creating and selling pin-back buttons that read “Why Haven’t We Seen a Photograph of the Whole Earth Yet?” The buttons were meant as a call to NASA  who supposedly harbored a full-color picture of planet Earth at the time  to make the image public. Two years later, NASA released the image, which is often credited as a major influence in the formation of the environmentalist movement. But this was just the beginning of Brand’s influence in American culture. In 1968, he founded and published the Whole Earth Catalog, a collection of reviews and information on tools such as maps, garden tools, forestry gear, welding equipment, and a host of other items that anyone might need to start a life of self-sufficiency. The periodical, which ran until 1972, was instrumental in fostering both a do-it-yourself mentality in the counterculture, as well as the back-to-the-land movement popular at the time. Unlike many environmentalists, Brand has often been one of technology’s biggest champions. Given his history, it comes as no surprise that Brand happens to be one of the catalysts behind “de-extinction,” a project which recently made headlines by taking its first steps toward bringing the extinct passenger pigeon back to life. Using new techniques in genomic engineering, Brand and his colleagues hope to revive the passenger pigeon and a variety of other extinct species that were severely affected by human interference in their ecosystems. Posted on December 6th under Global Ecology.